Head and neck cancer is one of the most common cancers, accounting for approximately one-sixth of cancers worldwide. Majority of head and neck cancers (>90%) are squamous cell carcinoma. Currently, they are mainly treated with surgery and chemotherapy. Most patients in stages I and II are mainly treated with surgery or radiotherapy (RT). However, the systematic chemotherapy remains the only effective treatment for patients with recurrence or metastasis, using platinum combined with fluorouracil or taxane (with the promised rate of approximately 30%, progression-free survival of 3–4 months, and overall survival of 6–8 months).,, Thus, developing novel therapeutic strategies for patients with advanced head and neck cancer is highly necessary. Apatinib is one of the novel orally smallmolecule tyrosine kinase inhibitors that highly selectively binds to and strongly inhibits vascular endothelial growth factor receptor 2 (VEGFR2), resulting in decreased vascular endothelial growth factor (VEGF) mediated endothelial cell migration, proliferation, and tumor microvascular density. Due to its encouraging results in preclinical and clinical settings,,, apatinib was approved and launched in the People's Republic of China in 2014 as a subsequentline treatment for patients with advanced gastric cancer. In addition, apatinib has potential antitumor activity in a wide range of advanced solid tumors including non-small cell lung cancer, breast cancer, and hepatocellular carcinoma.,,, They are currently undergoing Phase II/III clinical trials in China. However, the efficacy of apatinib in treating patients with advanced head and neck carcinoma has not been reported. Herein, we report for the first time three patients with advanced head and neck neoplasms who responded to apatinib and S-1. Patient one, a 66 year-old man, visited the hospital with chief complaints of local mass in the left neck on February 2018. The patient underwent puncture biopsy. 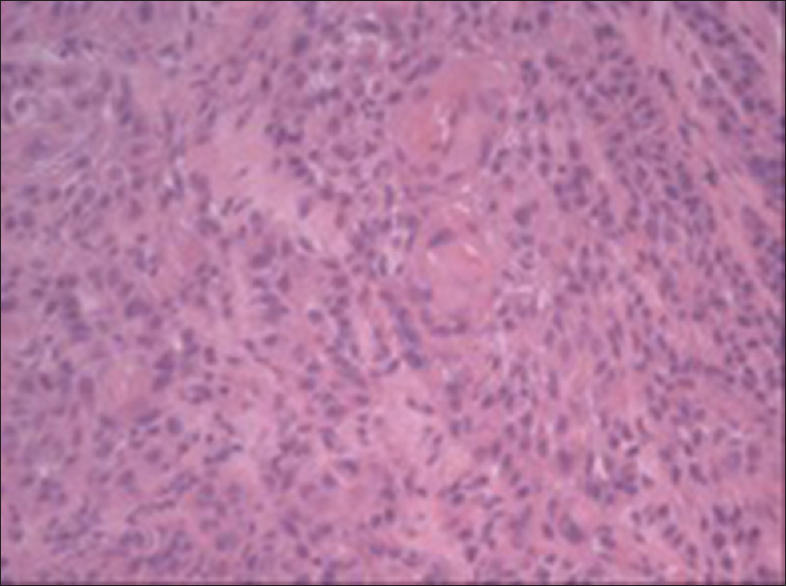 Pathological diagnosis confirmed hypopharyngeal carcinoma [Figure 1]. Four-cycle chemotherapy with TP regimen (docetaxel and nedaplatin) was administered. In May 2018, neck and chest computed tomography (CT) was performed, revealing increased cervical lymph node metastasis with no significant changes in the neck mass. He refused to receive further cetuximab and vein chemotherapy due to chemotherapeutic toxicities, including nausea, vomiting, and leukopenia. 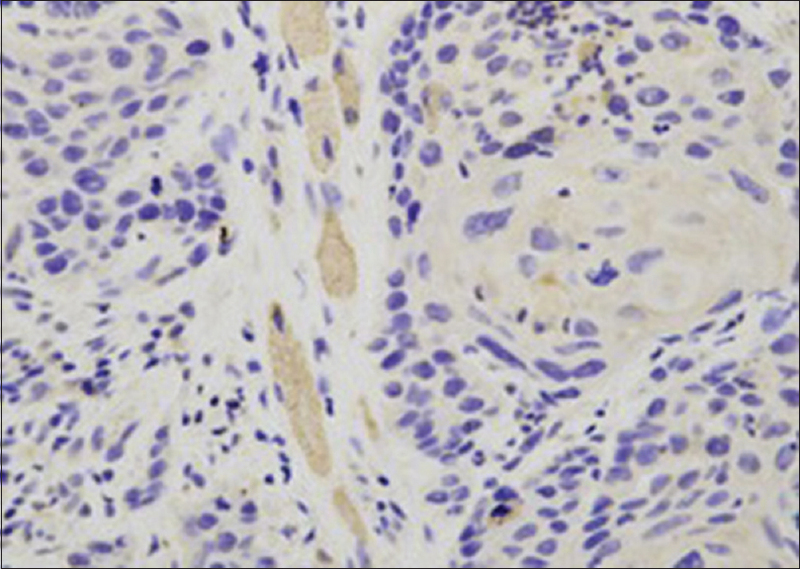 Most cells showed strong positive staining for VEGFR-2 [Figure 2]. Therefore, the treatment was changed to apatinib and S-1. Apatinib was administered at 425 mg daily and S-1 at 60 mg twice daily. Half a month later, the neck tumor was partially detached, and the lesions significantly shrunk. The patient refused to undergo CT every month following apatinib administration. 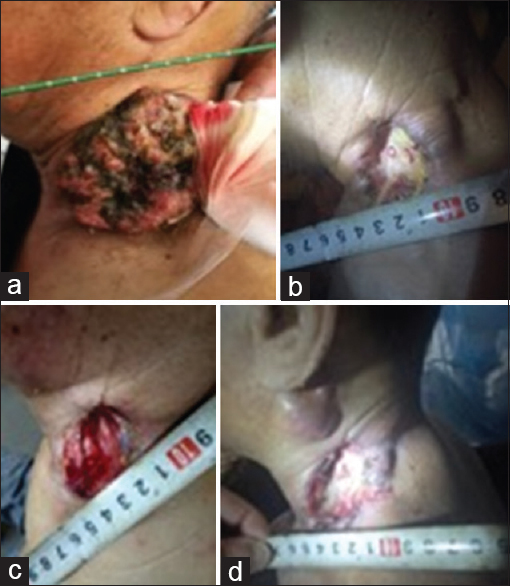 During the 1-month follow-up, the measurable lesion in the neck shrunk [Figure 3]a and [Figure 3]b and continuously shrunk at the 3-month follow-up [Figure 3]c. However, at the 4-month follow-up, a new measurable nodule was found [Figure 3]d, which was considered as PD according to the Response Evaluation Criteria in Solid Tumors (RECIST) 1.1 standard (The RECIST Working Group). The patient stopped taking apatinib and S-1 after suffering from cerebral infarction in October 2018. The patient experienced moderate high blood pressure and mild hand-foot syndrome, which were well controlled after appropriate treatment; no severe toxicities and other treatment-related adverse events were observed. Patient two, a 46-year-old man, visited the hospital with chief complaints of local mass and pain in the left neck in July 2018. The patient underwent puncture biopsy. 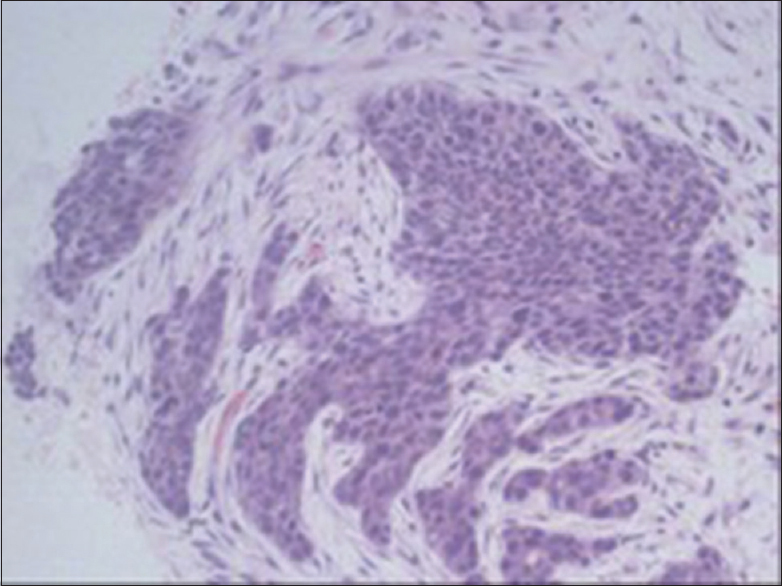 Pathological diagnosis confirmed metastatic squamous cell carcinoma, whereas nasopharyngeal carcinoma was suspected on the basis of immunohistochemical examination [Figure 4]. However, nasopharyngoscope, CT, and positron emission tomography-CT findings did not reveal the primary lesion. Two-cycle chemotherapy with TP regimen (docetaxel and nedaplatin) was administered. In September 2018, neck and chest CT was performed. 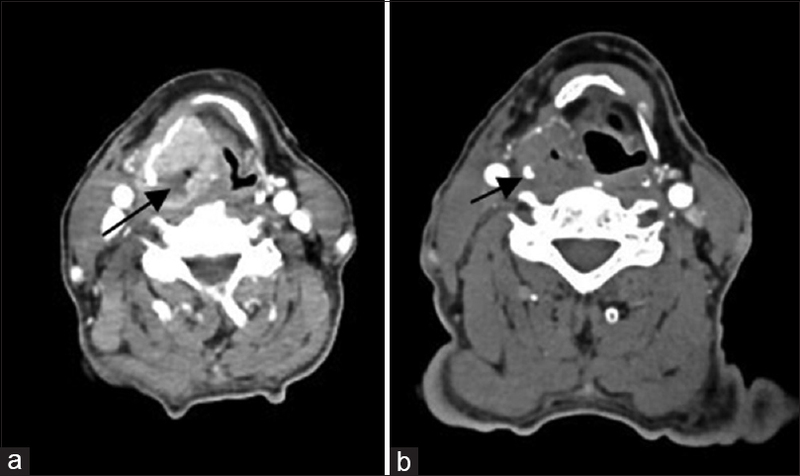 CT results revealed a neck mass that is much larger than the baseline diameter [Figure 5]a and [Figure 5]c. He refused to receive further vein chemotherapy due to chemotherapeutic toxicity, including nausea, vomiting, and leukopenia. 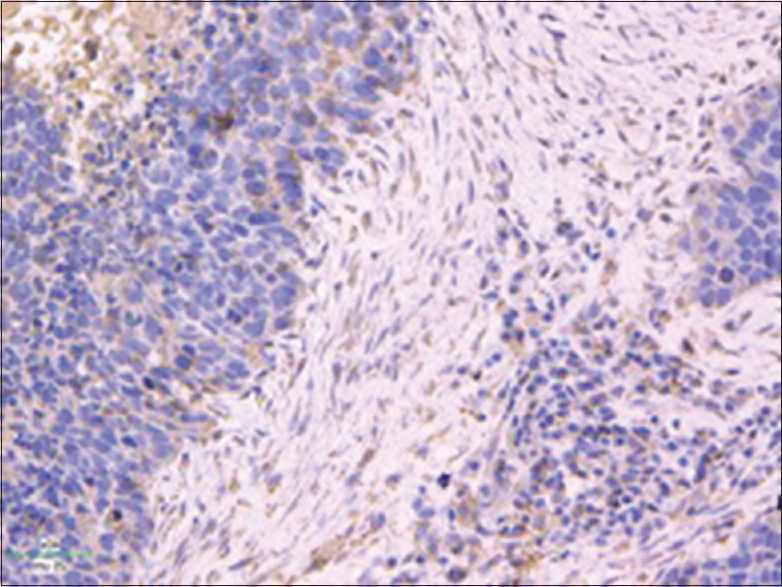 Most cells also showed strong positive staining for VEGFR-2 [Figure 6]. Therefore, the treatment was changed to apatinib and S-1. Apatinib was administered at 425 mg daily and S-1 at 60 mg twice daily. After 15 days, the neck tumor was markedly reduced. During the 1-month follow-up, the measurable neck lesion was almost flat, which was considered as PR according to the RECIST 1.1 standard. After the 2-month treatment with S-1 plus apatinib, the tumor continuously shrunk [Figure 5]b and [Figure 5]d. No new measurable lesion was observed, which considered SD according to the RECIST 1.1 standard. With the exception of mild hand-foot syndrome, gum swelling and pain; and oral mucosa ulceration, (which were well controlled after appropriate treatment), no severe toxicities and treatment-related adversities were observed. The patient continuously used apatinib and S-1 as maintenance therapy. Patient three, a 71-year-old man, visited the hospital with chief complaints of oropharyngeal pain in July 2018. The patient underwent puncture biopsy. 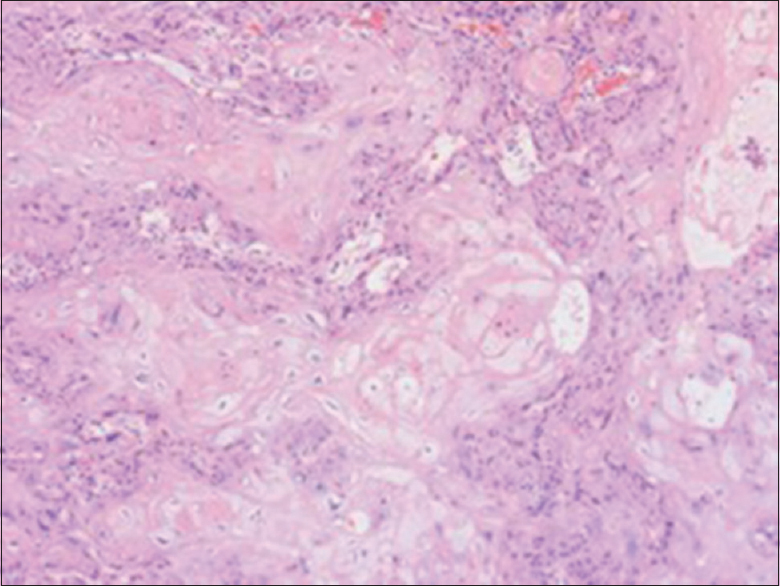 Pathological diagnosis confirmed squamous cell carcinoma of the pyriform sinus [Figure 7]. Four-cycle chemotherapy with TP regimen (docetaxel and nedaplatin) was administered. In October 2018, the neck and chest CT was performed after four-cycles of chemotherapy, which revealed that the oropharyngeal mass became larger than its baseline size [Figure 8]a. He refused to receive further vein chemotherapy due to chemotherapeutic toxicity, including vomiting and leukopenia. 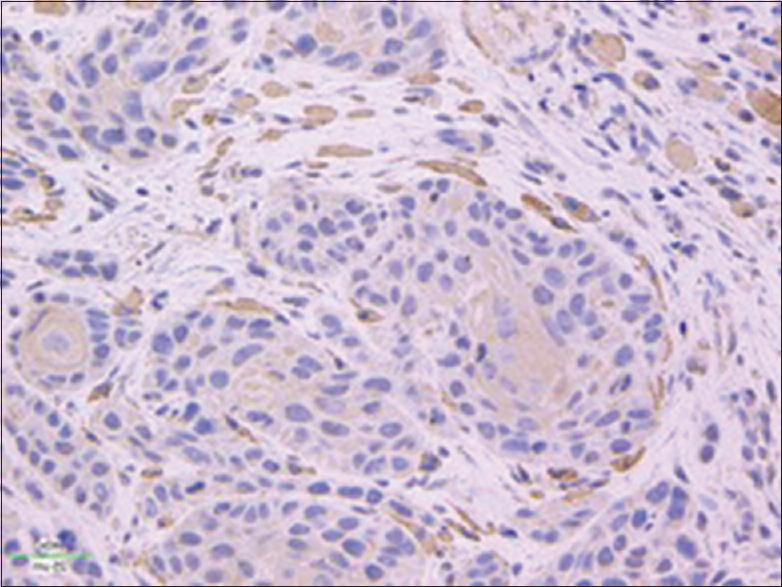 Most cells also showed strong positive staining for VEGFR-2 [Figure 9]. Therefore, the treatment was changed to apatinib and S-1. Apatinib was administered at 425 mg daily and S-1 at 60 mg twice daily. A month later, the oropharyngeal tumor was markedly reduced [Figure 8]b, which was considered as PR according to the RECIST 1.1 standard. With the exception of mild hand-foot syndrome, no severe toxicities and treatment-related adversities were observed. The patient continuously used apatinib and S-1 as maintenance therapy. 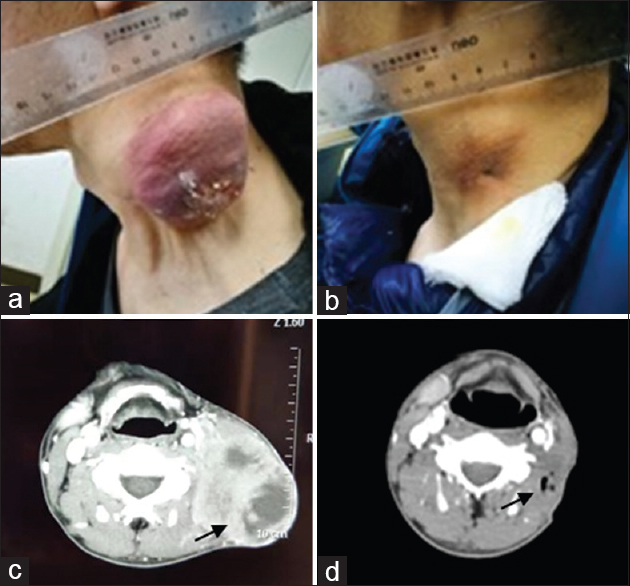 Platinum-based chemotherapy is the usual first-line treatment for inoperable, recurrent, or metastatic squamous cell carcinoma of the head and neck (SCCHN); however, its results are far from satisfactory. Platinum combined with docetaxel as induction treatment yields high ORR and CR in unresectable SCCHN cases., Therefore, the TP regimen used as the first-line treatment. Head and neck cancer cells often express the epidermal growth factor receptor (EGFR). Cetuximab is an IgG1 monoclonal antibody that inhibits ligand binding to the EGFR 5–7. In 2006, the Food and Drug Administration confirmed cetuximab as the only effective drug for patients with recurrent/metastatic SCCHN who did not receive platinum therapy. In the first-line therapy, adding cetuximab to cisplatin improves the response rate compared with cisplatin alone. Cetuximab has shown a good regional-targeting advantage in randomized trials in many countries and can increase the survival rate of patients with SCCHN by 9% (45.6% vs. 36.4%). However, cetuximab is very expensive. These two patients cannot afford its cost. Apatinib is an oral small-molecule anti-angiogenesis inhibitor that plays an anti-tumor role by selectively inhibiting the phosphorylation of ATP binding sites in VEGFR-2 expressing cells, thereby blocking downstream signal transduction. Considering the high expression level of VEGFR-2 in the tumor section of patients one and two, apatinib was recommended. Moreover, the cost of apatinib is one-third to that of cetuximab. Thus, patients one and two chose apatinib after careful consideration. Considering that many studies have reported the effectiveness of fluorouracil for the treatment of head and neck tumors, apatinib combined with S-1 was administered in these patients. For patients one and two, during the 15-day follow-up following apatinib and S-1 treatment, PR was met according to the RECIST 1.1 standard. For these three patients, during the 1-month follow-up, the measurable neck lesion continuously shrunk. However, PD was observed at the 4-month follow-up in patient one. For patient one, he stopped taking apatinib and S-1 after suffering a cerebral infarction. In addition, all patients lived without severe toxicity or drug-related side effects. Apatinib may be used as an additional treatment option for advanced head and neck neoplasms. Combined with our findings, the efficacy and safety of apatinib in patients with advanced head and neck neoplasms should be further assessed in large-scale prospective studies. Agaimy A, Weichert W, Haller F, Hartmann A. Diagnostic and predictive molecular pathology of head and neck neoplasms. Pathologe 2018;39:42-7. Mifsud M, Eskander A, Irish J, Gullane P, Gilbert R, Brown D, et al. Evolving trends in head and neck cancer epidemiology: Ontario, Canada 1993-2010. Head Neck 2017;39:1770-8. Kang MH, Kang JH, Song HN, Jeong BK, Chai GY, Kang K, et al. Concurrent chemoradiation with low-dose weekly cisplatin in locally advanced stage IV head and neck squamous cell carcinoma. Cancer Res Treat 2015;47:441-7. Harari PM, Huang SM. Head and neck cancer as a clinical model for molecular targeting of therapy: Combining EGFR blockade with radiation. Int J Radiat Oncol Biol Phys 2001;49:427-33. Ferrarotto R, Kies MS, Garden AS, Kupferman ME. Neoplasms of the head and neck. Holland-Frei Cancer Medicine 2016. p. 1-37. DOI: 10.1002/9781119000822.hfcm084. Meshram SD, Kamble KM, Diwan AK, Mohobia VK. Conventional vs concomitant boost radiotherapy with concurrent cisplatin in advanced head and neck cancer. J Cancer Res Ther 2015;11:770-4. Li G, Lin H, Tian R, Zhao P, Huang Y, Pang X, et al. VEGFR-2 inhibitor apatinib hinders endothelial cells progression triggered by irradiated gastric cancer cells-derived exosomes. J Cancer 2018;9:4049-57. Yang C, Feng W, Wu D. Apatinib for advanced nonsmall-cell lung cancer: A retrospective case series analysis. J Cancer Res Ther 2018;14:159-62. Fan M, Zhang J, Wang Z, Wang B, Zhang Q, Zheng C, et al. Phosphorylated VEGFR2 and hypertension: Potential biomarkers to indicate VEGF-dependency of advanced breast cancer in anti-angiogenic therapy. Breast Cancer Res Treat 2014;143:141-51. Peng H, Zhang Q, Li J, Zhang N, Hua Y, Xu L, et al. Apatinib inhibits VEGF signaling and promotes apoptosis in intrahepatic cholangiocarcinoma. Oncotarget 2016;7:17220-9. Fang SC, Zhang HT, Zhang YM, Xie WP. Apatinib as post second-line therapy in EGFR wild-type and ALK-negative advanced lung adenocarcinoma. Onco Targets Ther 2017;10:447-52. Li X, Le L, Han L, Zhang Y, Sun S. Short-term efficacy and safety of apatinib in advanced squamous cell carcinoma of the lung. Indian J Cancer 2017;54:547-9. Kim R, Hahn S, Shin J, Ock CY, Kim M, Keam B, et al. The effect of induction chemotherapy using docetaxel, cisplatin, and fluorouracil on survival in locally advanced head and neck squamous cell carcinoma: A Meta-analysis. Cancer Res Treat 2016;48:907-16. Mesía R, Vázquez S, Grau JJ, García-Sáenz JA, Lozano A, García C, et al. Aphase 2 open label, single-arm trial to evaluate the combination of cetuximab plus taxotere, cisplatin, and 5-flurouracil as an induction regimen in patients with unresectable squamous cell carcinoma of the head and neck. Int J Radiat Oncol Biol Phys 2016;94:289-96. Luo X, Zhang B, Lian Z, Dong Y, Liu J, Pei S, et al. Value of two-cycle docetaxel, cisplatin, and 5-fluorouracil induction chemotherapy in hypopharyngeal carcinoma. Neoplasma 2018;65:269-77. Bonner JA, Harari PM, Giralt J, Cohen RB, Jones CU, Sur RK, et al. Radiotherapy plus cetuximab for locoregionally advanced head and neck cancer: 5-year survival data from a phase 3 randomised trial, and relation between cetuximab-induced rash and survival. Lancet Oncol 2010;11:21-8. Zhang H. Apatinib for molecular targeted therapy in tumor. Drug Des Devel Ther 2015;9:6075-81.